Hello All! A very Happy Memorial Day to everyone. On this day, we pay our respects to the many veterans who served our country. For that, we are and will always be extremely grateful. Thank you!!! One of the ways we pay respect is by gathering with friends and family and essentially eating vast quantities of food. This year, I was a ahead of the game for once and was prepping the macaroni salad the day before. That stuff always tastes better the next day anyway. I was assembling the ingredients to make the dressing. Mayo, sour cream, sugar, salt, pepper, and dry mustard. Dry mustard. I pull the “tin” down from the top shelf in the cabinet. I am not a tall person, so this event occurs with a bit of straining on my part. When I finally get the mustard down, I notice it is brand new. That causes a memory to flash thru my mind. This memory is of the LAST time I used dry mustard. I mentioned it’s on the top shelf of the kitchen cabinet. The LAST time I grabbed the mustard, it slipped from my hand and fell. On the way down, the lid came off and mustard went everywhere. I mean EVERYWHERE. It was all over me, the counter, the stove, the sink. It might have even found it’s way to one of our cats. Needless to say, I was pissed. Mostly at myself because I should have been more careful, but at the poor packaging design that causes this to occur. I don’t seem to recall having an accident like this with the Cumin! Granted, that’s on the lower shelf. So here we are again, the dry mustard and I. There is no love lost between us. We both have a job to do so let’s just get it over with, right? I score the tape that is holding the lid on and try to carefully pull the lid off. Nothing. I look at the lid again. Looks like I scored it on the wrong spot. Okay. I score the lid again,and try to lift it. Still not budging. Now I am impatient. This same lid had absolutely no problem coming off in midair before! I grab the box with one hand and the lid with the other and give a decent pull. Sure enough, off comes the lid…along with a good bit of the mustard that is…you guessed it…EVERYWHERE. All over my arms, the floor and some on my face. Seriously!!! Can this be happening to me, again? What the hell. 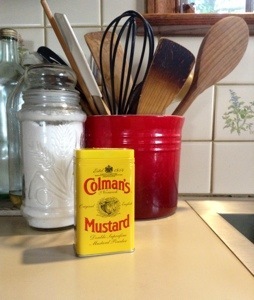 Until we meet again, Colman’s Mustard. Until we meet again. Categories: Random Thoughts | Tags: accident, color, memorial day, mustard, spice, spill, Yellow | Permalink.